Have you ever stopped and thought about how much time you spend looking at digital devices on any given day? Between our smartphones, tablets, televisions, and computers for many of us, that number is quite high. 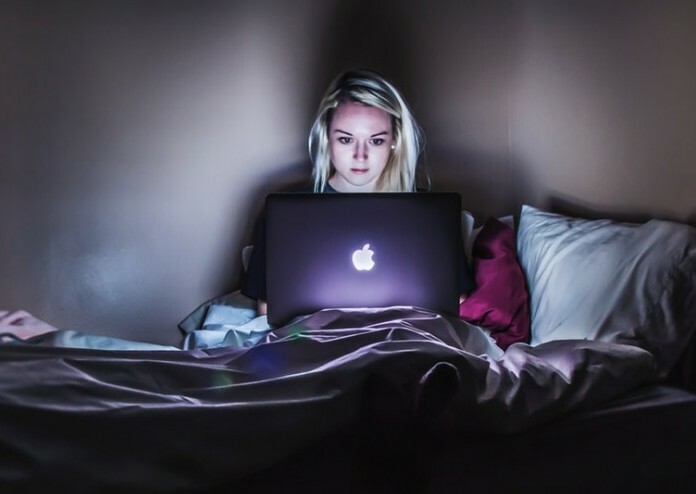 The HEV (high-energy visible) blue light that is emitted by these digital devices, has been linked to disrupting your sleep/wake cycle, as well as a variety of other serious eye conditions. But what is HEV blue light and how do we encounter it? Are there benefits to blue light? How does it affect your eyes? Blue light is a part of what is known as the visible light spectrum and the visible light spectrum is only a small part of a much larger electromagnetic spectrum. The visible light spectrum consists of all the colors that combine together to make the white light that we see. The electromagnetic spectrum is the range of all electromagnetic radiation, which is a type of energy and consist of various different wavelengths. As you can tell by the different types of electromagnetic radiation, there are waves all around us from a variety of different sources. The length of these waves has a direct correlation to their energy. Waves that have shorter wavelengths have more energy, and waves that have longer wavelengths will have less energy. Radio waves, for example, have longer wavelengths and therefore have less energy. UV waves have shorter wavelengths and therefore have more energy. 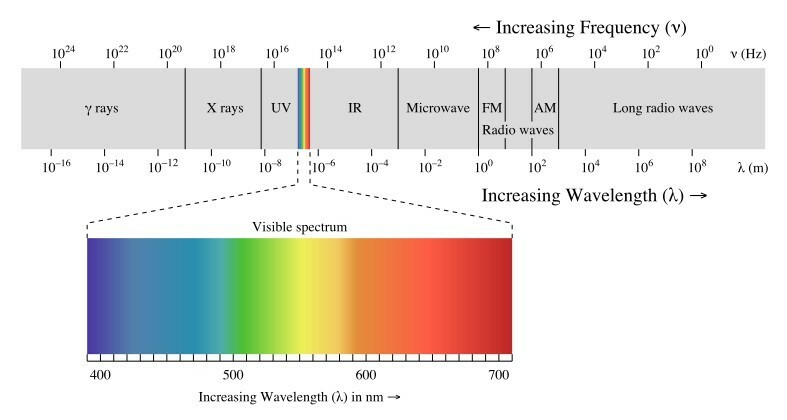 You can see by the diagram above, the blue light is on the end of the visible light spectrum that is closer to the higher energy and more harmful waves such as UV and X-rays. Blue light is defined as containing wavelengths between 400-500 nanometers and having the most energy out of visible light. Red on the other end of the spectrum has longer wavelengths and the least energy out of visible light. Blue light can come from a variety of different sources. There is the natural source, the sun. The sun is the single largest source of blue light. The sky looks the color blue due to blue light from the sun colliding with air molecules and scattering. Blue light can also come from artificial sources. These sources include digital devices such as your smartphone, tablets, computers, televisions, even LED lights, and fluorescent lights. Even though the amount of blue light that emits from these devices are small compared to the sun, what experts are worried about is the fact that we tend to spend hours at a time looking directly into these devices. 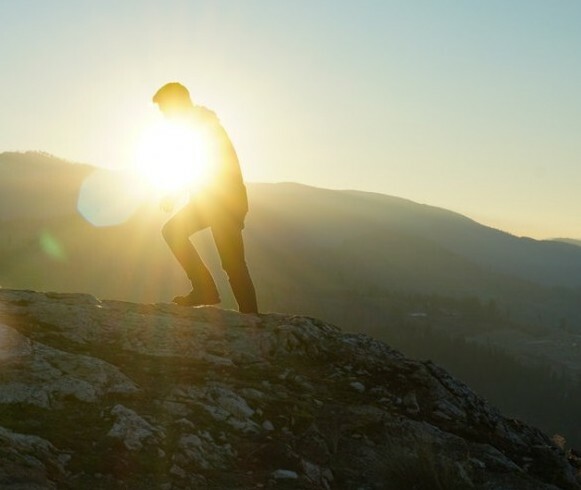 While the sun might emit much more powerful blue light, you don’t spend hours looking directly at the sun. Your body naturally uses blue light from the sun to help regulate your sleep/wake cycle which is known as your circadian rhythm. This is why experts recommend limiting your exposure to blue light late in the evening time as it could cause problems for you trying to fall asleep. Blue light during the day has also been associated with boosted alertness, improved memory and cognitive functions, and improved mood. The main problem with blue light is the eyes lack of ability to be able to filter out the blue light before it reaches your retina. The lens and cornea of your eye are very good at filtering out UV rays, but let through nearly all visible blue light. Blue light has been thought to accelerate age-related macular degeneration, which could lead to total vision loss. Recently researchers from the University of Toledo focusing on one specific molecule may have determined exactly how blue light is damaging your eyes. In this study, the researchers were focusing on a certain molecule called the “retinal”. Our photoreceptors need these molecules for use to be able to see. In this study when researchers would introduce blue light to these retinal molecules, the molecule would produce a toxic chemical. The toxic chemical would, in turn, kill the photoreceptor cells. Our photoreceptors cells are what we need to be able to see, and without those we are blind. photoreceptor cells do not have regenerative properties, which means once they die they don’t come back. Since blue light is everywhere and we can’t exactly hide from the blue light from the sun, and with digital devices becoming more a part of our daily lives avoiding it altogether isn’t a realistic option. That doesn’t mean that you can’t do things to help protect your eyes against the harmful blue light. Screen Time – While it is quite impossible to avoid digital devices altogether. You can be more mindful of how much time you are actually spending on your devices especially around bedtime. Exchanging out that extra episode on Netflix for a book could add up to a lot of hours over a course of a lifetime. Give your eyes a break at times, and blink more often to keep your eyes moist. Screen Filters – Screen filters are a great way to cut down on the blue light you are exposed to. These filters are available for pretty much any device you can think of, your smartphone, tablets, even your computer screens. Blue Light Blocking Glasses – Blue light blocking glasses are a simple way to protect your eyes from blue light. If you already wear prescription glasses, you can get blue light blocking prescription lenses and you will have protection all the time. Alternatively, if you wear prescription glasses you can get blue light blocking clip-on glasses that could go over your current prescription glasses. If you don’t wear glasses at all, you can still get glasses that offer blue light protection without any prescription or magnification. Adjust Screen Brightness – Adjusting your screen and lowering the brightness could help, especially at night time. Some higher-end computer monitors have a built-in blue light filter feature. Smartphones and tablets at times will have a nighttime feature which adjusted the color to provide a more comfortable viewing experience after dark. Even though more research is before we can fully understand the long-term effects of blue light on our eyes, we should be doing everything we can to protect our eyes. There just isn’t enough data yet for us to understand what a lifetime of looking at digital devices will do to our eyes. It may seem like a long time ago, but the first iPhone was only introduced a little over a decade ago. What are your thoughts on blue light? I would love to hear from you drop a comment below! If you have any questions or comments, don’t hesitate to leave them below and I will get back to you.